Bri is originally from Longmont, CO, and relocated to Fort Collins to attend CSU. 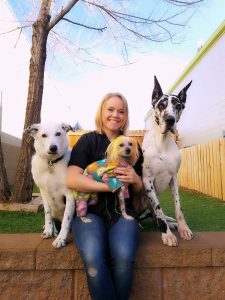 She graduated with a degree in Business Administration Management in 2011 and has used her passion for working with animals to pursue a career in the pet care industry. She has over 12 years of experience working with pets of all shapes and sizes. Her and her husband Ty have two amazing dogs, Lela and Stitch, as well as a cat, Phindi, a snake, and some backyard chickens. 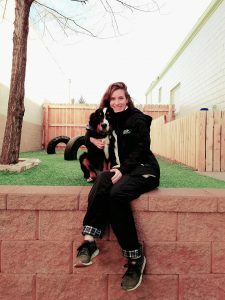 Bri truly loves getting to spend every day with dogs and enjoys meeting so many dog lovers in our Fort Collins community. 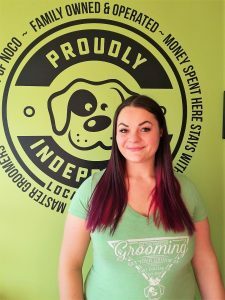 Kelsey started grooming professionally in 2009 and she received her master groomer certification in 2017. She grew up in Wyoming, but now lives in the beautiful state of Colorado. At home, she has three dogs and one cat. Outside of work, Kelsey loves CrossFit and competes in Olympic Weightlifting. Amy is a mother of two boys and a fun-loving lab named Tess. She has been a groomer at The Dog Pawlour since the very beginning and truly loves her job! 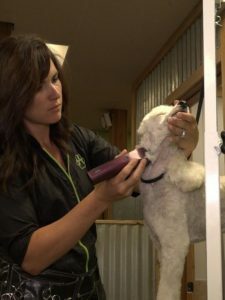 Amy enjoys being able to help make everyone’s pups look their best and enjoy their groom while also building lasting relationships with her clientele. Jessica has always had a great love for dogs. From a very young age, she wanted to become a veterinarian. 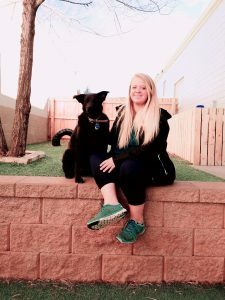 She began working as a veterinary assistant while in high school and a year after graduating she moved to Fort Collins to further her dream. 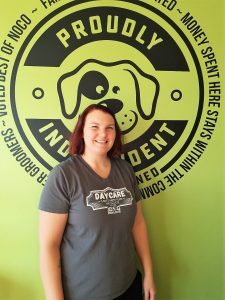 Shortly after moving, Jessica acquired a position at a local dog grooming/daycare facility where she rediscovered her love of dogs and her passion for industry. Through her work she then decided that she wanted to become a dog groomer. Jessica has now been grooming since 2011. 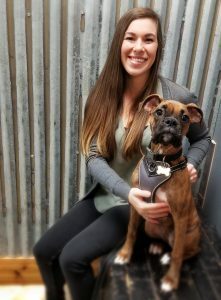 Her other passion is training, she is an instructor of Canine Nose Work and has 3 dogs of her own that she enjoys training in a wide variety of dog sports including nose work, agility, dock diving, rally, barn hunt, and conformation. Originally from El Paso Texas, Gloria has been living in Fort Collins for nearly a year. When she’s not at work, you can catch her outdoors enjoying the Colorado sunshine with her 6-year-old Pomeranian named Lucky. Gloria loves working here since it has always been her dream to have a job working with animals! 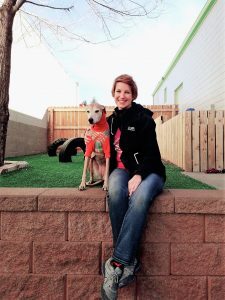 Chloe is a native northern Coloradoan who loves being outdoors and enjoys everything this great area has to offer with her four-legged friends and family. She says that working at the Dog Pawlour is such a privilege because she gets to meet and work with so many wonderful people from the area and their dogs who are so clearly loved and always have the best personalities! Chloe is certified in CPR and first aid for canines and has received formal training on dog behaviors and pack leadership. 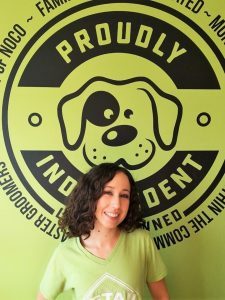 She is extremely passionate about working with animals and their owners and is thankful for not only the great team we have, but all our great clients that make every day at the Dog Pawlour a rewarding one. Emma recently moved to Fort Collins from her hometown in Orange County, California. 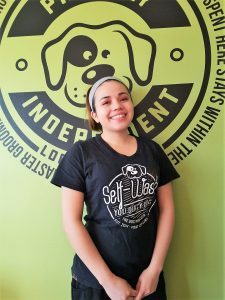 She has many years of experience working with animals and their favorite humans and loves getting to know all the wonderful Dog Pawlour parents who call into the shop! On the weekends Emma enjoys going on hikes with her husband and her Boxer puppy Hazel who is constantly keeping her parents on their toes. 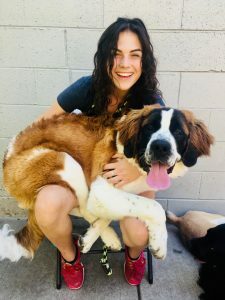 Ana was originally born in Spain, but grew up in Vail and Montrose, CO. She started working at The Dog Pawlour in 2017 and has been loving it ever since! Ana has a kitten named Echo. She is a C.S.U. student studying Human Development & Family Studies with a minor in criminology. Ana has been working with dogs since she was 16 and though she does not currently own any, she would like to say, “In loving memory of Titan and Teva”. Jenny is from Michigan originally but has been living in Fort Collins for almost 2 years now. She has a 9-year-old greyhound mix named Braylon who is the love of her life. Braylon came to daycare first and loved it so much she told her mom she should work here, so she did! (Jenny has been working at The Dog Pawlour since October of 2018). Some of her favorite things to do outside of work are hiking with friends, reading classic literature/watching classic movies, and singing as loud as she can! Originally from Lake Bluff Illinois, Kylie has been living in Fort Collins since 2014. She has been working at The Dog Pawlour since June of 2016. Kylie is the proud owner of an 8-month-old Bernese Mountain Dog named Hazel who she loves to walk, hike, and train with! 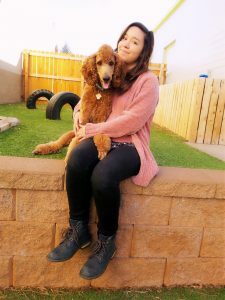 Originally from Wisconsin, Ann has been working at The Dog Pawlour since July 2018. When she isn’t at work, Ann can be found paddle boarding or riding horses. Ann has no shortage of pets with 5 dogs, 2 cats, and 2 horses! © 2017 The Dog Pawlour - Do not copy . All rights reserved.